The motivation for my blog is back with a bang and I'm desperate to churn out post after post. I woke up on Sunday morning after getting my sleeping pattern semi-back on track (no thanks to insomnia) and was like "I WANT TO SHOOT ALL THE PHOTOS TODAY" so that's exactly what I did! Chapters of Kat has dabbled in fashion here and there but I bet one thing you didn't know about me is I love shoes. Ok I don't just love them, I'm obsessed. My shoe collection is expanding rapidly, it's a bit ridiculous. Everytime I open my wardrobe I'm terrified of having an avalanche of shoes coming at me. Regardless, I thought I'd break it down and show you the shoes (mostly boots) I've been loving throughout Winter. + Zara Ankle Boots The newest addition to my ever-growing collection of ankle boots, aren't they lush? I fell in love with them when I spotted them on Robyn's blog and there was literally no stopping me. I needed them and soon enough I toddled off to Zara and had them firmly on my feet. 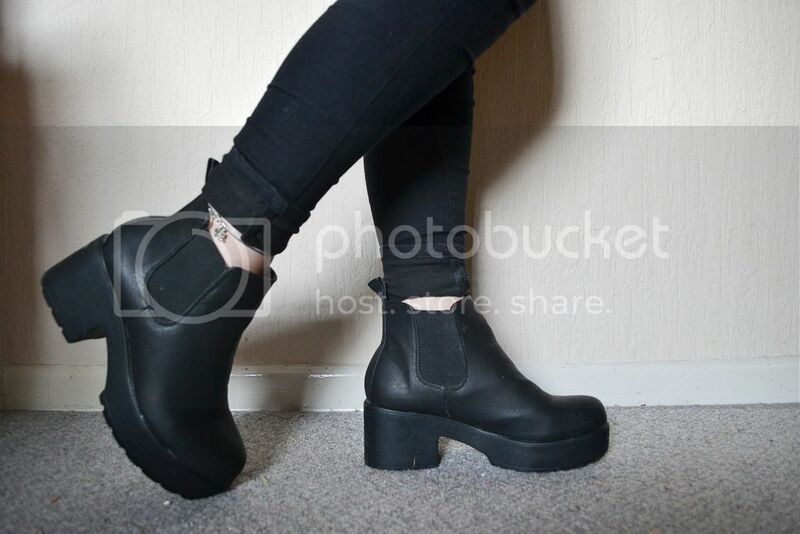 I've never owned a pair of ankle boots like this as I usually just go for a flat sole or ones with a chunky platform. The unique cut of the boot is what caught my eye, along with the contrast of the pleather against the material panel... They're quite something and surprisingly comfortable! 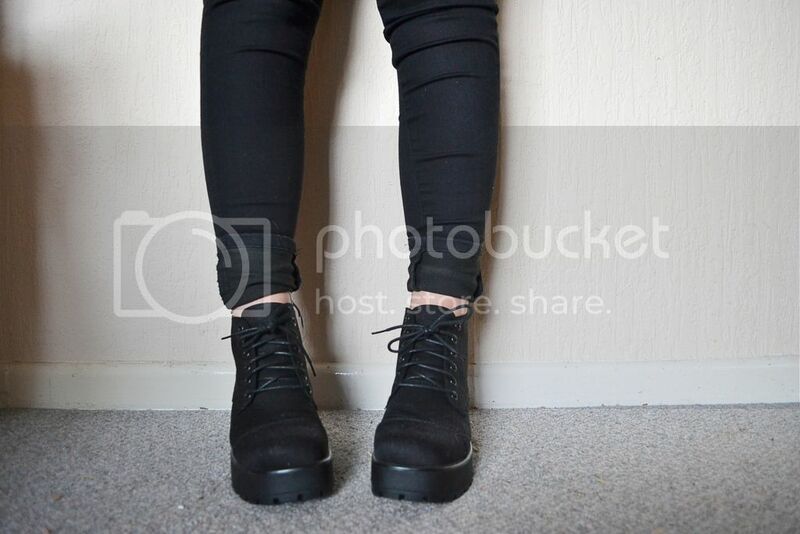 Go To Outfit: One of my favourite outfits at the moment is wearing a simple black shirt with my Topshop ripped Jamie jeans and these lil booties. Simple yet on trend. 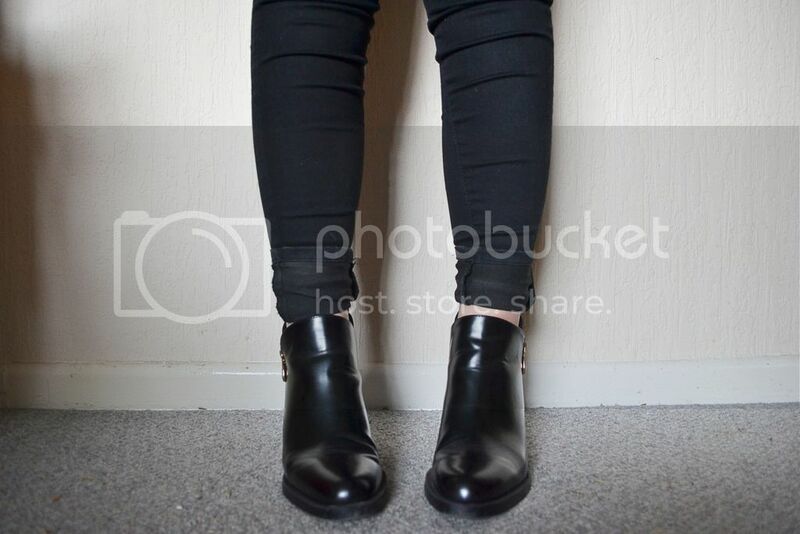 + Platform Chelsea Boots Believe it or not, I actually got these from eBay! Amazing right? They're such good quality. Hands down the comfiest pair of boots I have ever owned. Up until I got a pair of Vagabonds (coming up next) these lil' babies were my go to shoes, it was rare to see them off my feet. Although I haven't worn them much this past Winter, they are the perfect style of shoe for this cold and yucky weather. Everyone needs toasty feet! Go To Outfit: I pair anything and everything with these bad boys. They can transform any outfit into something a little more edgy instantly, even a boring old t-shirt and pair of jeans! + Vagabond Dioon Lace Up Boots My 20th Birthday present, a pair of Vagabonds. I had been lusting after the Dioon Lace Ups for so long and they were well worth the wait let me tell you. You know the feeling of love between a mother and her child? That's basically how I feel about these shoes. They're my babies. My Vagabonds were extremely comfortable to break into, not a blister in sight and they just look bloody fab really! I wouldn't advise wearing a canvas pair in the rain but if you fancy splurging, the leather Dioons seem equally as amazing and rain proof. Go To Outfit: I really enjoy wearing my Vagabonds with a dress and my camel coat, in particular shirt dresses - example here. Lord knows I need that extra height (thank you whoever invented platform shoes) and can be used to dress up or dress down an outfit as they're so versatile and easy to wear! 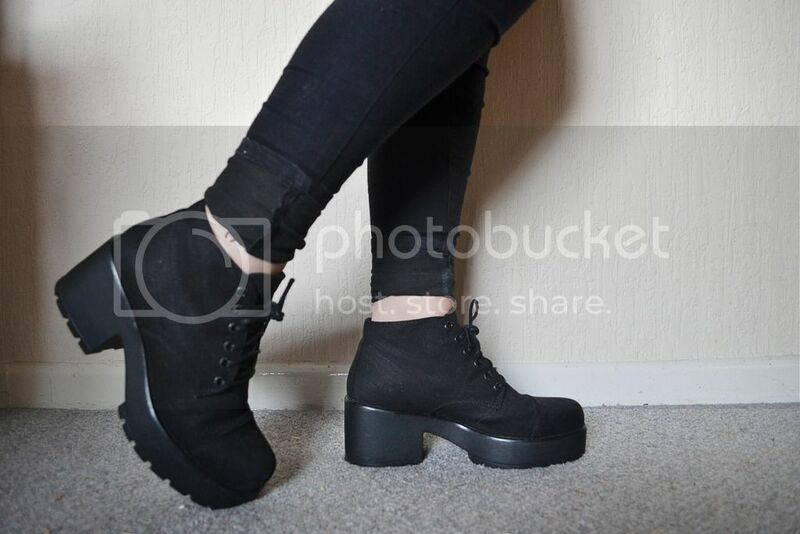 + Primark Ankle Boots These are my bargain buys for sure. For £13 you really can't go wrong! As you can probably tell, most of my shoes are black until I decided back in Autumn that I wanted needed brown boots in my life. As they don't have a platform or a heel, they are so easy to just throw on and wear all day with no aching tootsies. Go To Outfit: I love to wear these boots with a big chunky knit cardigan as it makes me feel all snug and cosy - example here. I think it's better to see the picture to get a feel of the outfit otherwise you're probably like "what?". 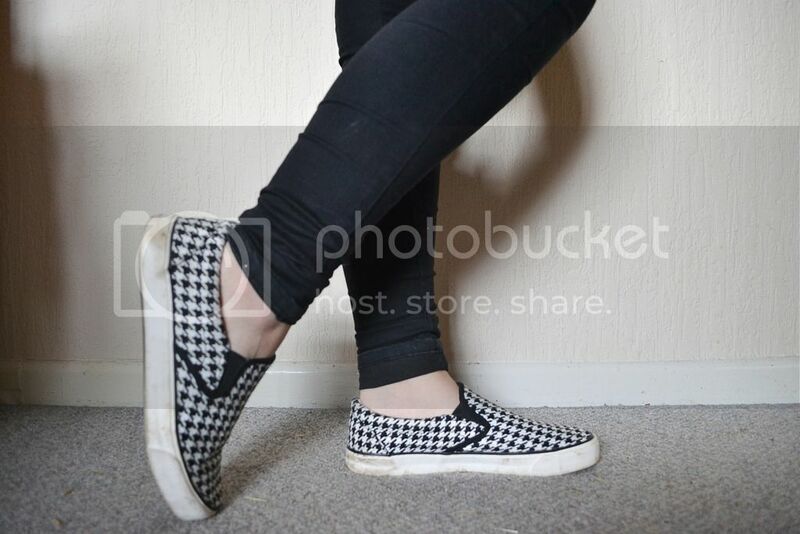 + New Look Flats If there's one print I absolutely love, it's Dogtooth. These are absolutely my most worn flats ever since I wore my white Converse to death and I adore them as you can probably tell, the soles are looking pretty rugged. Comfy and cute as heck, what's not to love about them? I tend to wear these in the warmer days throughout Winter (yes, they do exist) when I know that I don't have to wear about 10 pairs of socks in fear that my ankles/feet will turn into little blocks of ice. Go To Outfit: These shoes are fab when it comes to running errands. Paired with my blue Topshop Jamie jeans and a slouchy, slogan tee, they make an effortless but cute outfit. 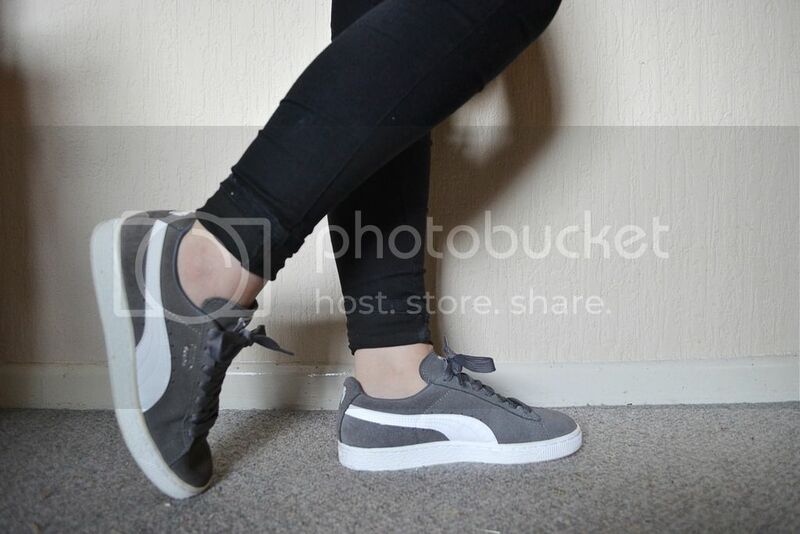 + Puma Suede Trainers Up until last year, I can't remember the last time I owned trainers but aren't they fab?! 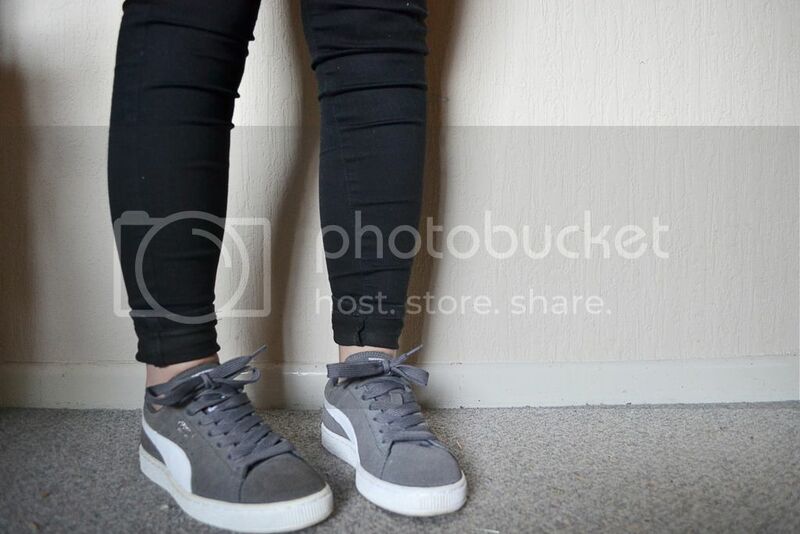 I'm sure trainers aren't everyone's cup of tea but I've grown quite fond of my Pumas! Similar to the New Look flats, they're definitely for warmer days and definitely not made for rain. Suede + rain = NOPE! Go To Outfit: A crop top and pair of ripped jeans is the way to go with trainers - example here. Not everyone who wears trainers has a tracksuit and wears ginourmous hoops (but if you do, that's fine, you do you boo) and they look hella' on trend when styled right. I hope you enjoyed a peek into my shoe collection, let me know if you liked it! What are your go to shoes for Winter? 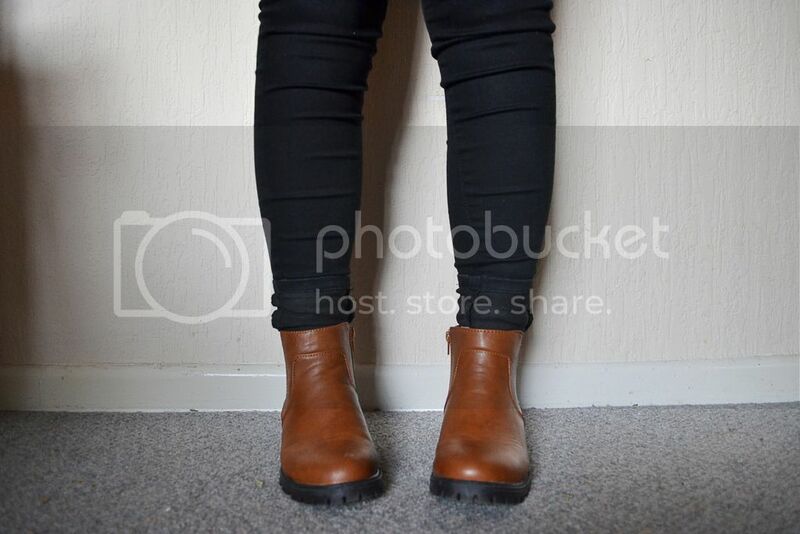 Love those platform Chelsea boots! Great picks! 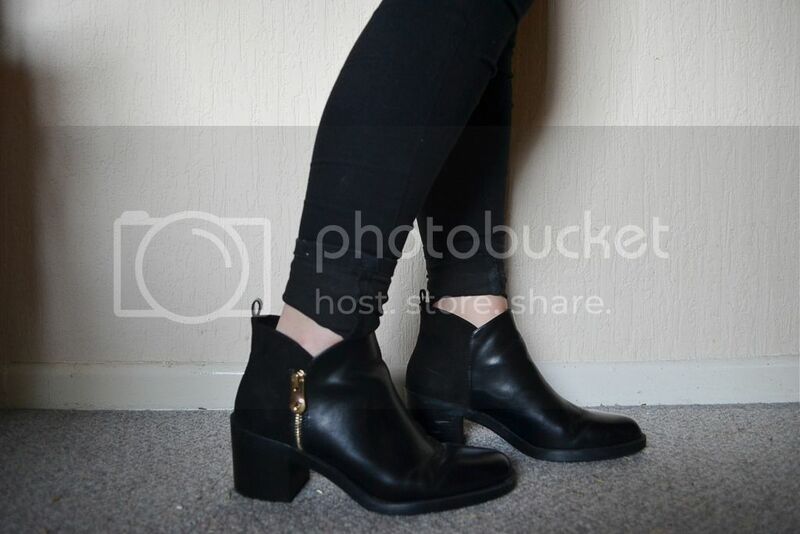 Love the ankle boots from Primark! They're fab aren't they? And such a bargain, only £13! I love your ankle boots from Primark! I've been living in ankle boots all winter too! 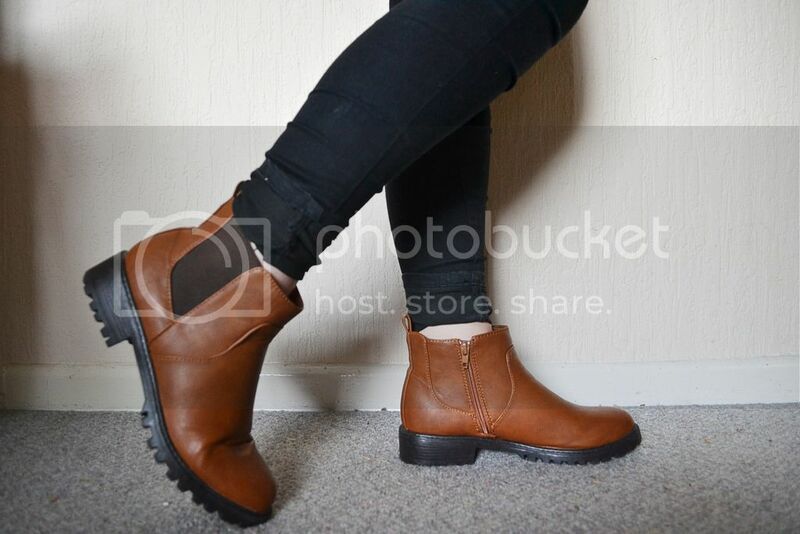 Ankle boots are essential for Autumn/Winter I feel (even though I wear them all year round oops)! If there´s one thing that I don´t have enough of it´s shoes. 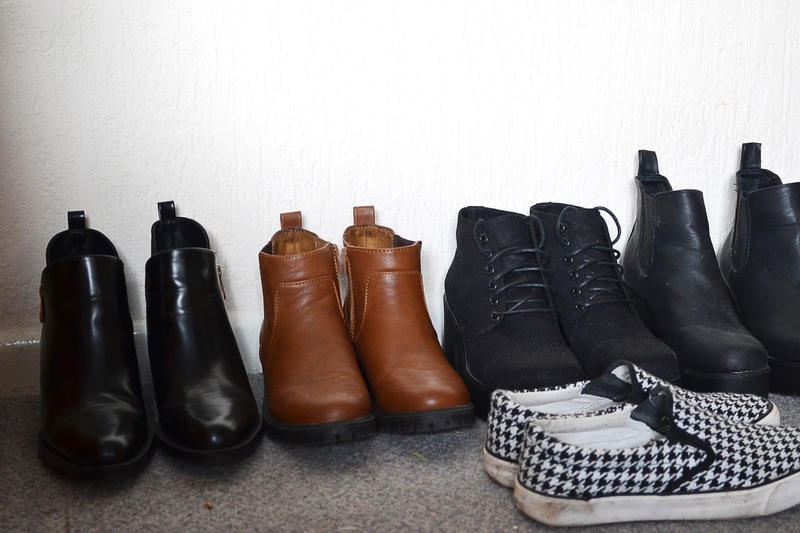 For example, I don´t own any simple flat shoes for winter. Not one pair! So I´m mostly going to uni in my trainers as I can´t be bothered with heals (as comfortable as they might be). So thank you for all the shoe inspiration here. I definitely have to go shoe shopping now! 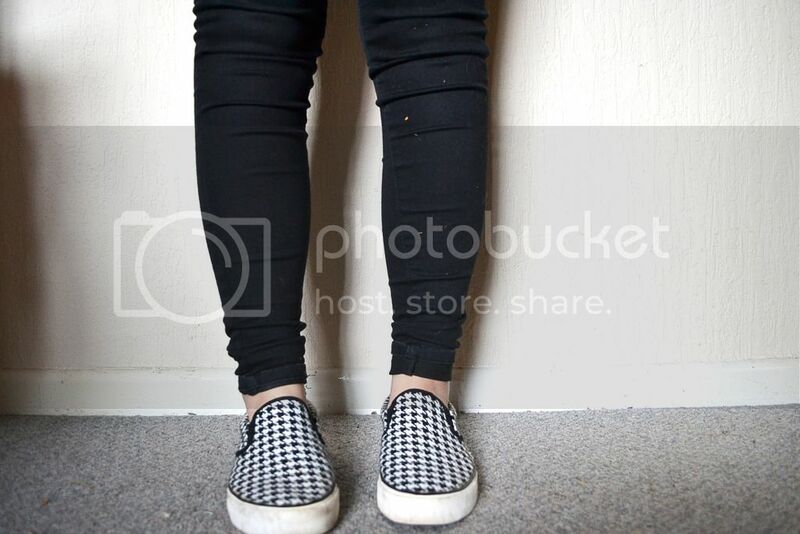 :O Girl get yourself some more shoes asap. We can never have enough!! Oh the puma ones are lovely! 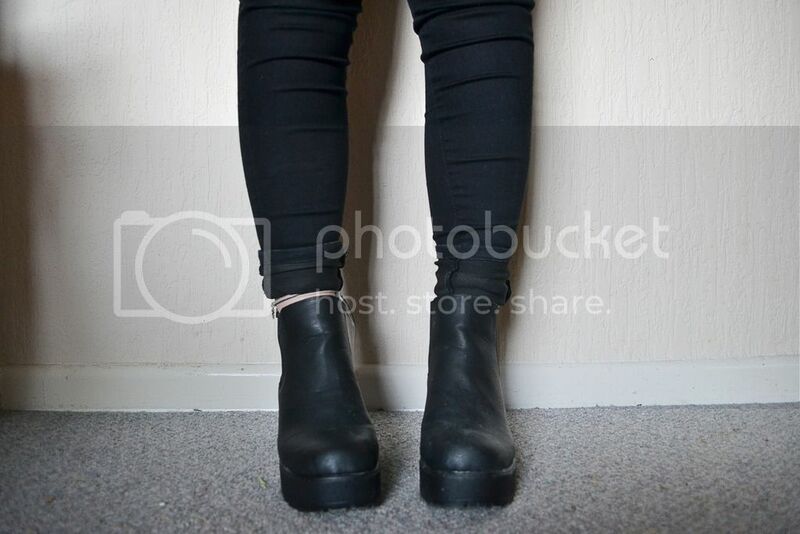 I have so many pairs of boots at the moment and my go-to is just a ankle pair of black boots from Topshop. They are now really scruffy but no other pair match it - it's so comfy haha. I have a pair from Topshop that I've just worn to DEATH. I think it's time for them to go even though they're so comfy haha! I love every single pair of these shoes so much !! I have a similar pair to your second ones from EBay.. Mine are from Primark and I wear them ALL THE TIME! I adore the suede Pumas too.. I think I need to pick up a pair of trainers soon, especially for spring time! Yay for the motivation & this amazing shoe-loving post, babe. Gorgeous booties & they suit you so great. Suede sneakers look amazing, if only we had a climate of Hawaii here, right?! But then we'd probably live in flip flops (which isn't bad at all lol). Enjoyed this little peek into your shoe collection hon! Oh man, total shoe envy. I really need some new flat boots and some new trainers haha!